The sound decoder I want to use is a SoundTraxx Tsunami. The only version currently available is rated at 1A, which is not enough for the Mikado. Thus it is practical to mount the motor decoder in the loco, and the Tsunami in the tender. 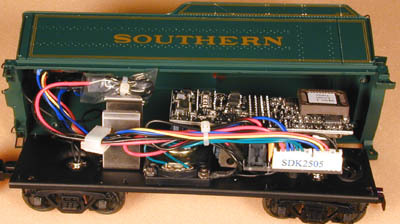 Because there are pickups on the drivers, pilot truck, and trailing truck, the locomotive and tender can be completely separate, with no wires running between them. The Tsunami can be used to control the rear light. Remove the mounting screws (one in each corner) and lift off the shell. Here's the tender with the shell off. Wires prevent moving the shell completely. 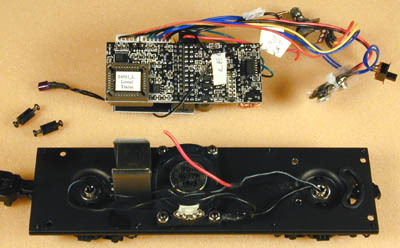 Remove the switch (2 screws) and volume control (2 screws) from shell. 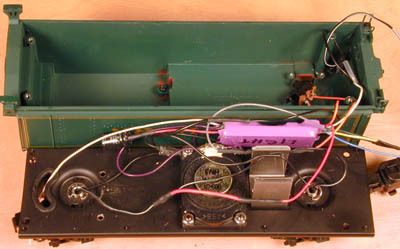 I also removed the wire guide (shown in the picture) and the wire tie (not shown) to make it easier to trace the wires. Cut the wires to the LED rear headlight, leaving plenty of wire to solder to. The next step is to unplug and remove the two PCBs on top. The plugs are tight, but will come off. I used a small screwdriver to pry them apart a little to get started. This picture shows the two boards almost unplugged. Here are the two boards removed. Remove the two small screws holding the mother board, and remove it. 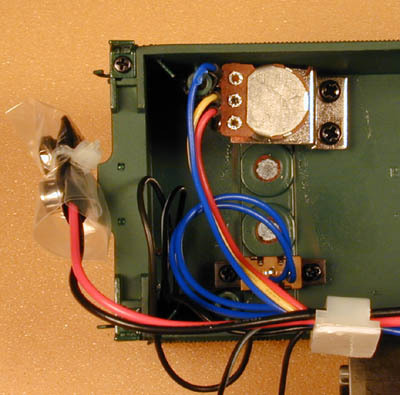 After cutting the wires from the pickups and de-soldering the speaker wires, the TMCC electronics come free. I also removed the two mounting posts, but that's not really necessary. 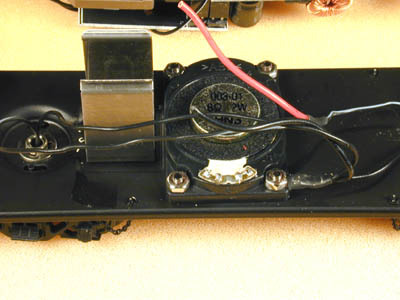 Remove the right pickup ground from the speaker mount. Connect the red wire from the Tsunami to the red pickup wire. In all cases use shrinkwrap to cover any bare wire. 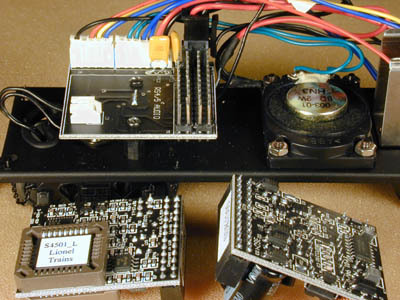 Connect the black wire from the Tsunami to the black pickup wire. To allow reading back of CVs while programming, connect a 39 ohm resistor (this is what comes with SoundTraxx DSX decoders so I had a bunch in stock. Anything from 10-40 ohms will work great) to the grey wire. Connect the orange wire to the middle pin on the switch that came in the tender (under the cover), use the extra orange wire to run from the rear terminal on the switch to the other side of the 39 ohm resistor. With the switch in the forward setting the resistor will be removed from the circuit for normal running. With the switch in the rear position the resistor will be in the motor drive circuit for programming. 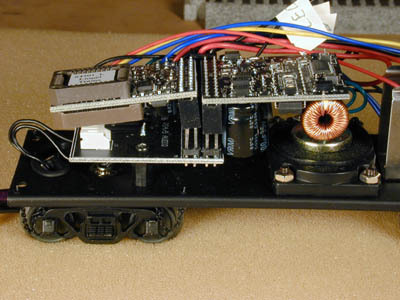 If you run the loco with the switch in the rear position you may burn out the resistor, nothing else bad should happen. I hot glued the resistor to the bracket (its behind the bracket in this picture. Connect the blue wire to a 680 ohm resistor, then to the positive wire from the tail light (LED). The positive wire is black with a white stripe. Connect the other wire from the TL to the yellow wire. Solder the two speaker wires from the Tsunami (violet) two the terminals on the speaker.